Portrait oriented poster mounted in a wooden frame with a glass protective cover. The poster features a yellow background with a map of Australia decorated in brown brick work with a green tiled roof on top. Alongside this are green gum and palm trees with an image of a one pound note and text underneath. The text is printed in black, red and white. There is also the Australian Coat of Arms printed in red in the bottom right hand corner. The poster is mounted in a wooden frame painted white with a wire cord suspended on the back. Dimensions: 790mm high x 545mm wide x 30mm deep. Between 1945 and 1965 more than two million migrants came to Australia. ‘Populate or perish’ was the catchcry, as the Australian Government embarked on an intensive international promotional campaign to encourage migration to Australia. Most were assisted where the government paid most of their fare to get to Australia. The campaign initially targeted the English with assistance schemes such as ‘Bring out a Briton’, but later it was expanded to provide assistance and reunion to other Europeans. In 1942 the Commonwealth Government set up a Department of Post War Reconstruction so that a number of major projects were when war ended. It clear Australia needed far more people to achieve these goals. The first major post – war wave of migration started with displaced persons. These people fled their countries because their homelands were destroyed in the war or they had been taken over by the Soviet Union. Between 1947 and 1953, the Australian Government assisted over 170,000 displaced persons to migrate to Australia. Many came from Eastern Europe where they had suffered terribly during the war. In return they had to stay in Australia for at least two years and work in whatever jobs the government gave them. A number of migrants spent their first months in Australia living in migrant hostels while they tried to find themselves a home. Some found work in factories; others did the hard and dirty jobs in heavy industry. Skilled migrants found it hard to have their training and qualifications recognised and had to accept what work was available. All migrants, especially those who did not speak English well, had to put up with prejudice. The second wave of post-war immigration arrived in the 1950s and 1960s, and consisted of those seeking employment and better living conditions. These included migrants from Italy, Greece, Malta, Croatia and Turkey. These programs were an enormous success. The origins of ‘New Australians’ changed markedly, with British migrants only making up half of the intake, and many migrants coming from southern, eastern and northern Europe. This meant the end of Anglo hegemony in Australia. In 1955 the one millionth migrant arrived in Australia and mass migration programs continued into the 1970s. The migrant camp accommodation was basic army surplus style of unlined, unheated iron sheds and timber barracks which were freezing in winter and hot in summer. A disused army camp was used at Bathurst New South Wales as there was a housing shortage there and other states after the war and very little other accommodation available for migrants. Many of the barracks were in very poor condition and needed constant repair. For single people, narrow iron beds set out in dormitory style made up their quarters while the married quarters were partitioned off into separate sections. There was no privacy. 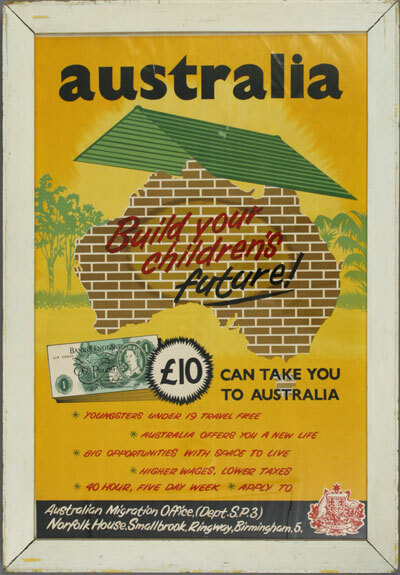 The Australian Migration Office Poster is historically significant as evidence of the efforts the Australian government took to attract people to Australia in the decades immediately after World War II. The immediate target was to bring 70,000 people to Australia. It was soon recognised that they were not going to get this many from the traditional source of migrants, Britain and Ireland so began to target potential migrants in the Displaced Persons camps in Europe. Thompson. S 2011, New Australia: The Snowy Mountains Hydro – Electric Scheme 1949 – 1974, Migration Heritage Centre, Sydney. Thompson. S 2011, A Place for Everyone: Bathurst Migrant Camp 1948 – 1952, Migration Heritage Centre, Sydney.